The key player has forecasted that the global Offshore Oil & Gas Decommissioning market will see a capital expenditure (CAPEX) of $7,076mn in 2019. Read on to discover the potential business opportunities available. With reference to this report, it details the key investments trend in the global market, subdivided by regions, capital and operational expenditure and project type. Through extensive secondary research and interviews with industry experts, th e key player has identified a series of market trends that will impact the Offshore Oil & Gas Decommissioning market over the forecast timeframe. How is the offshore oil & gas decommissioning market evolving? What is driving and restraining the offshore oil & gas decommissioning market? How will each offshore oil & gas decommissioning submarket segment grow over the forecast period and how much revenue will these submarkets account for in 2029? How will the market shares for each offshore oil & gas Decommissioning submarket develop from 2019 to 2029? What will be the main driver for the overall market from 2019 to 2029? Will leading offshore oil & gas decommissioning markets broadly follow the macroeconomic dynamics, or will individual national markets outperform others? How will the market shares of the national markets change by 2029 and which geographical region will lead the market in 2029? What are the decommissioning projects for these leading companies? How will the industry evolve during the period between 2019 and 2029? 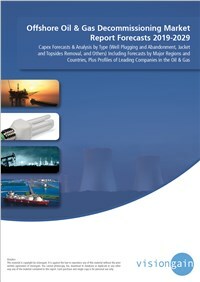 This report is essential reading for you or anyone in the Oil & Gas sector. Purchasing this report today will help you to recognise those important market opportunities and understand the possibilities there. I look forward to receiving your order.